The family Threskiornithidae includes 34 species of large wading birds. 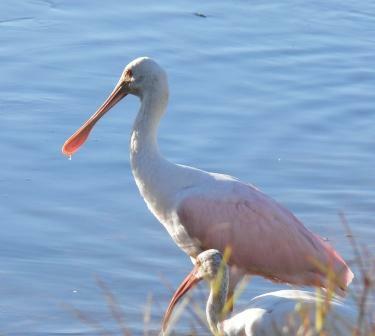 The family has been traditionally classified into two subfamilies, the ibises and the spoonbills, however recent genetic studies are casting doubt on the arrangement, and revealing the spoonbills to be nested within the old world ibises, and the new world ibises as an early offshoot. Members of the family have long, broad wings with 11 primary feathers and about 20 secondaries. They are strong fliers and, rather surprisingly, given their size and weight, very capable soarers. The body tends to be elongated, the neck more so, with rather long legs. The bill is also long, decurved in the case of the ibises, straight and distinctively flattened in the spoonbills. They are large birds, but mid-sized by the standards of their order, ranging from the Dwarf Olive Ibis (Bostrychia bocagei), at 45 cm (18 in) and 450 g (1 lb), to the Giant Ibis (Thaumatibis gigantea), at 100 cm (40 in) and 4.2 kg (9.2 lb). They are distributed almost worldwide, being found near almost any area of standing or slow-flowing fresh or brackish water. Ibises are also found in drier areas, including landfills. The Llanos are notable in that these wetland plains support seven species of ibis in the one region.